Make up collection/ Home decor. How to utilise small spaces when you have A LOT of stuff! Today I thought I would share with you my storage solutions for all of my stuff! I currently live in London and as you probably know, space comes at a premium. I am lucky enough to have a spare bedroom which I can use as my office/closet/spare bedroom/everything else room! Here are some ideas I have come up with to help me make the most of the space that I have. Here you can see that I have made this area into my study area/ make up area. I have two ikea Alex drawer sets which house my makeup collection and my craft/ sewing equipment for scrapbooking and making things. I also have an ottoman stool to sit on which I keep all of my bedsheets in. I have also got some silver buckets on a rail for keeping my makeup brushes and stationary in (Ikea). 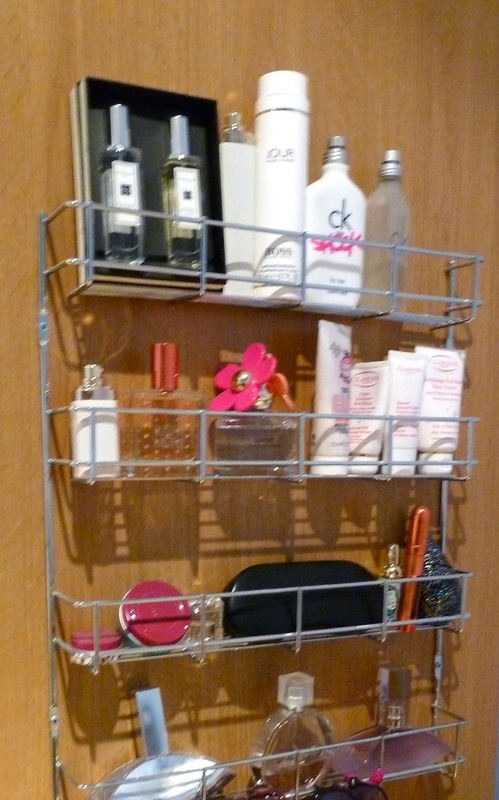 Here I have used a spice rack to hold my perfume bottles, sunglasses on the bottom and other miscellaneous items. It is really handy having these out and ready to use aa I can see everything I have. Displaying everything helps me use everything a lot more. Some perfumes do not fit in e.g. Nina Ricci so I keep these in the bathroom/ on the desk. I bought this holder from eBay and it holds around 40 nail polishes (they do come in different sizes). I have recently added my Ciate advent calendar nail polishes just in front of the holder and it stores them well and makes them easily accessible. I made this earring holder out of a picture frame and some plastic mesh canvas. 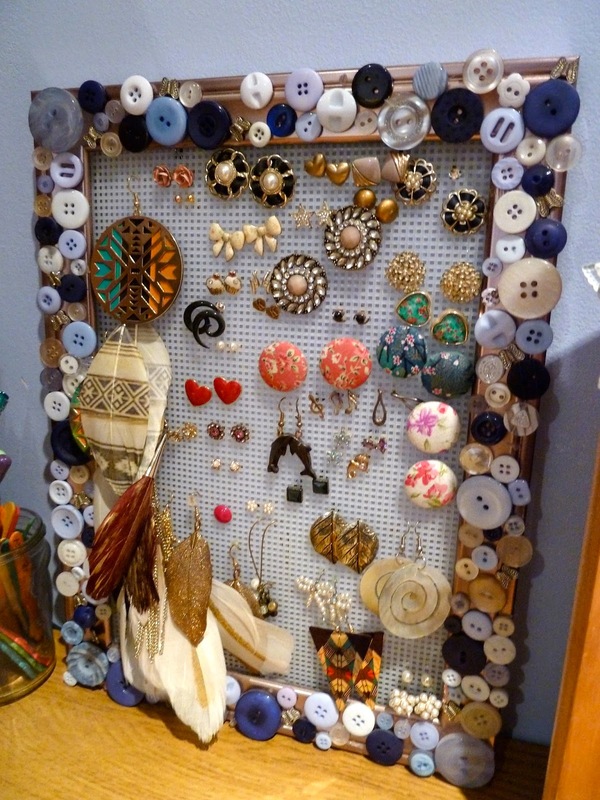 The holes are perfect for putting earrings through and I then decorated it with left over buttons and butterflies. It is a great way to store them and makes it easy to get them on and off. It is always difficult to know how to utilise a spare room so I recently purchased a daybed from Ikea. This is great because it acts as a sofa AND a bed. The bottom half comes out on wheels and forms a kingsize bed whilst retaining the lower part for two much needed storage drawers underneath. I leave the duvet on the bed which saves me having to find storage for it. I made the cushions with offcuts of fabric from Etsy which was much cheaper than buying ready made cushions.